Many thanks for these Wally, they seem to be starting to sell more fire engines this month. Wally, do you have anything on Indian 500cc Model 741's?? heard a rumour that large lots were sold off just after the war, but no hard evidence!! Thanks Wally, I had come to the same conclusion, only combinations, but when were they sold then? The RAF used thousands of them! the spares for them were not sold from the RAF till the late 80's! But they were for sure 500cc bikes, and there were a couple 750cc bikes too, but not many, I have one of them. Also the 1200cc ones, all with sidecar, so where the 600cc came from???? Yes, loads went to New Zealand, but also to the RAF in the UK! Wally, there are some Nortons from the contract that I'm researching on that last catalogue page. Would you be able to tell me where and when the sale was ? "this sale took place in june 1948" Only glanced at the Nortons, will have to see if the combinations on the prev. pages were B4's or not?? all listed as 500cc though, but more mistakes have been made with the capacity before! 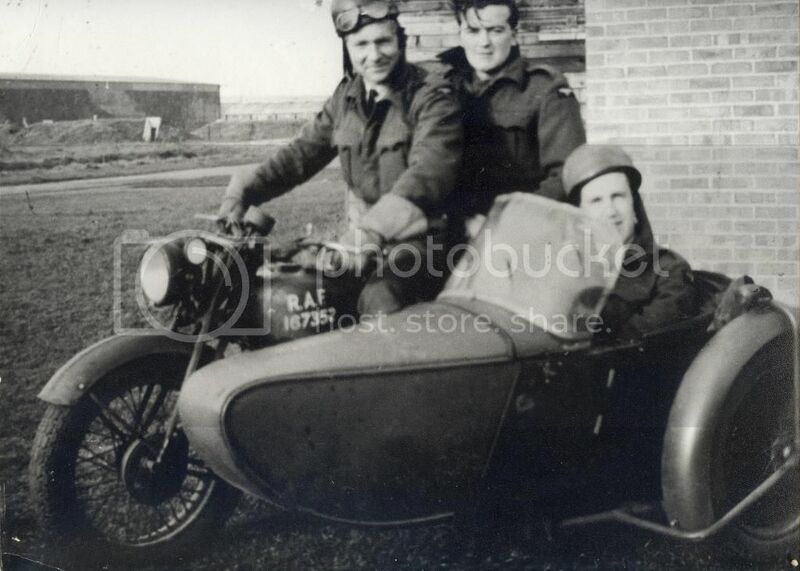 Lex, the third item on this latest page, listed as Norton Combination, 500cc was probably indeed a 16H - (RAF) 167490 - Here's a picture of RAF 167352 - a lateish war 18"-wheeled 16H passenger outfit. The serial number is close enough to imply that there may have been a block of numbers issued....but we can't link them to contracts at the moment. The registration number (G)UU allocated to the Indian was a Central London Series issued August 1942-on. Would this have been when new or indicate a transfer from a military to a civilian agency ? Thanks, Wally. I'll take ten of 'em ! I really do appreciate you posting these pages. Thanks a lot Wally!!! first time I see Welbikes listed in the sales cat's!! they were supposed not to be sold in the UK, was this the same sale as above? Any pictures of the dataplates of the Jeep? am sure other readers will want to see aswell. In March 1946 in the Commons Mr. Attewell asked the Minister of Supply and of Aircraft Production if it is proposed to allow the sale in this country of a proportion of surplus Army stock of lightweight folding motor cycles, known as Welbike, to individuals desiring to purchase for their own use. 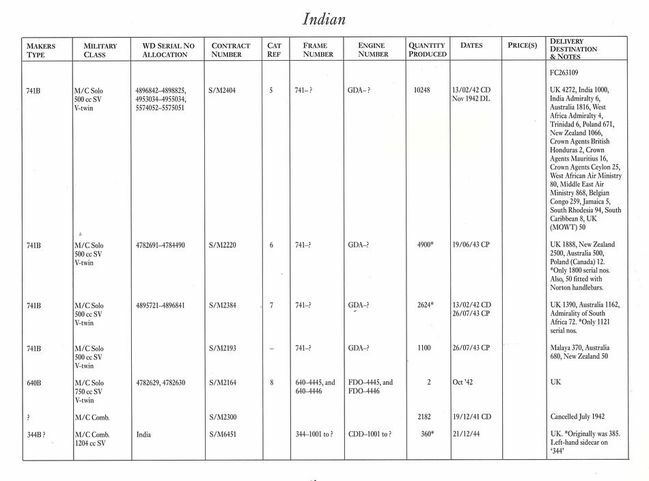 Mr. Wilmot all surpluses so far declared have been disposed of to an export firm for re-sale to America. This transaction was particularly welcome in view of the urgent need for dollars. These machines could not in any case have been used on the roads in this country without considerable conversion to comply with the requirements of the Road Traffic Act, 1930. I wonder what circumstances had changed that made it possible to auction Welbikes off to the public by December 1947? Thanks Wally, I keep meaning to ask, but what sort of scanner do you use? no offence, but it comes out terrible, maybe the settings can be twitched a little?? don't get me wrong here, I love the info!!. Dusty, that's interesting info, where did you get it from?